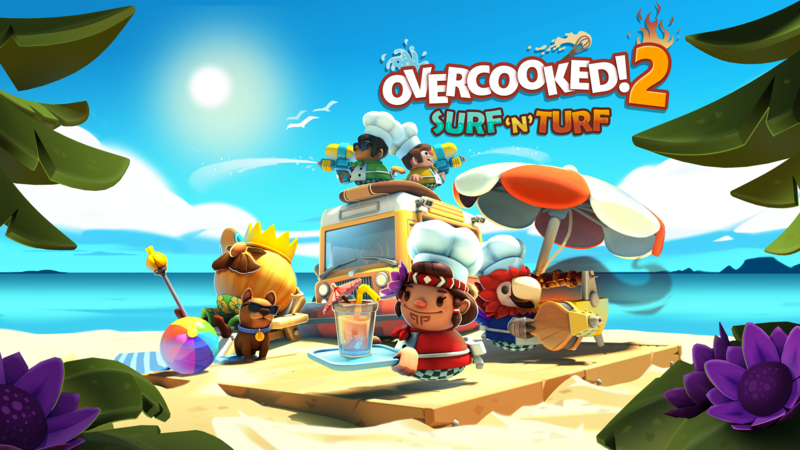 Today we’re excited to officially unveil our beach-themed Overcooked! 2 DLC, Surf ‘n’ Turf, available now on Steam, PlayStation 4, Xbox One and Nintendo Switch. Surf ‘n’ Turf includes 12 new campaign levels, new Versus and Kevin levels, new chefs and brand new recipes for kebabs and smoothies. We’ve also added in a fun new water pistol, that just might have functions beyond just putting out fires or distracting your fellow chefs. We’ll leave it up to you to uncover its hidden functionality, and once you do, we really think you’ll love it! Once you finish all the new story campaign levels, you’ll be able to up the difficulty in New Game+ in an effort to earn the coveted 4th star. It won’t be easy though; are you up to the task? Today at 4pm BST we will be livestreaming the brand new Surf ‘n’ Turf DLC across various channels, so if you’d like to check out some of the new content, be sure to tune in. As a bonus, we’ll also be streaming The Escapists: Complete Edition immediately after, showcasing the recent launch on Nintendo Switch. We’ll be answering all your questions about both games, so be sure to jump in chat!